Cinedelphia’s Trent Harris retrospective was a rare treat and an education for me personally. Recently I caught an episode of This American Life about a strange little film – that’s actually three films – concerning a man in a small town in Utah who dresses up in drag to perform an Olivia Newton John song at a highschool assembly. The episode was interesting to me in the abstract, but Cinedelphia’s presentation of the titular Beaver Trilogy has brought things full circle. I won’t discuss The Beaver Trilogy any further because there is a strange magic to these three short films when strung together, and I almost wish I had known nothing about them before I dove in. I will however take the time to discuss Luna Mesa, Harris’s most recent work and his official foray into the digital/HD realm. Harris takes his first steps with invention and depth. 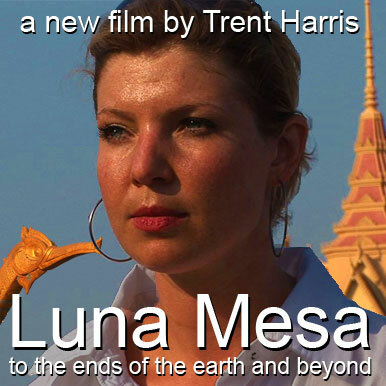 Luna Mesa unfolds like a noir-tinged episode of Globe Trekker, but instead of heretofore exotic places as the subject, Harris exposits tourism of a young woman’s psyche and the lingering presence of her dead lover. 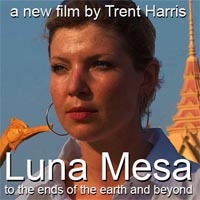 The film follows Luna, an unsure and wandering young woman on a fling with an older man in Cambodia who winds up shot dead. A recovered notebook of his leads Luna on an international quest to solve the murder, but equally it leads her inward. More to the point, who is leading her? We are entreated to assess the motivations of two people – one present one absent – for having been together and for separating. We are taken into a universe where the physical, psychological, past, present, actual, and fictional, are all parts of the flow of images. I found this jumble to be an exciting poetic presentation. Not edge-of-your-seat by any means, but exciting in its contemplativeness and creativity. Shot in Rwanda, Cambodia, Mexico, and Sierra Leone, Luna Mesa has an ambitious scale but its commercial-grade HD visuals and amateur performances give it gravity and texture. After the screening, there was a flurry of varied reactions. 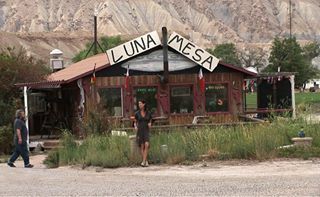 Even within the modest assemblage some couldn’t decide how they felt, others were strongly dismissive, and others still found much to admire in Luna Mesa. I am from the latter camp. Not adoring, but intrigued and delighted by Harris’s sense of lustless wandering and nods to noir. One audience member said that it wasn’t Harris’s film that captivated him in particular but his own projections upon the film about traveling as an older version of himself (with a much younger woman….wink wink, say no more). I found the anxiety and tenuousness of the central relationship worrisome (in the way Harris intended) which kept me from falling into distraction. Certainly the word “pretentious” was flung into the conversation. As I often feel, the word is perhaps misapplied. It is a word that shortchanges and is assumed to both begin and end a conversation about something. In this case, the word is applied to the parts of the film – elements recognizable as “artsy” like voice over narration with wordplay, abstract imagery (animations, symbols,), nonlinearity, literal visual metaphor, and collage-like editing, all on budget digital – but neglects its composite use of those parts into a functional language. If there is any truth to the pretention argument it is that the antagonist of the film, played by Harris himself, is a bit pretentious, manipulative, and cryptic. It is that quality that seeps into the skin of the film – as we discover how much his actions motivate the entire film – and leaves a residue. Luna Mesa does a number of things right. In particular, the grade of HD feels rough and energized. It is also just the right length, clocking in at about an hour. Harris makes the call when his tone and wanderlust are at the brink of self-indulgence. The few scenes of straight human interaction present some fantastic conversations pieces and memorable characters/caricatures. More than anything, globally conscious Luna Mesa is right at home in the language of modern independent cinema. It aims at the soul and the mind. Harris analogizes the idea of being lost in a world of symbols, ambiguity, facades, but relegates any indications toward technology in the digital medium of the film itself.